Congruent has been providing Dynamics GP services for over a decade to end clients, ISVs and Dynamics GP partners. Our expertise of implementing and customizing Dynamics GP from version 7.0 has enabled us to build a highly competent team of GP consultants and developers with sound knowledge on the functional and technical capabilities of the solution. Congruent has partnered with many ISVs over the years and developed successful products acting as their backend development team from offshore. Congruent has been providing add on development and customization service on Dynamics GP from version 7.0, accommodating to all the technological changes that have evolved with every new release for Dynamics GP. 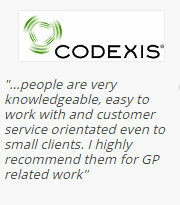 Over a decade of experience in providing services to our Dynamics GP partners, ISVs and end clients. We are one of the oldest players doing technical development right from the time when Dynamics GP was e-Enterprise. Working experience with Dexterity, VS Tools & Developer Toolkit, VBA, Modifier and Extender. For further queries or to express your interest in our Dynamics GP services, please fill in the enquiry form for us to touch base with you.